Slot Type Review, Progressive, Stand Alone Machines - SlotsSymbols.com - How do the progressive slots progress? How do the progressive slots progress? The gambler can also win the encouraging award, not only the dreamt jackpot. The most distinctive treat of this slot machine work that it's not related to the others. It isindependent progressive machine that doesn't' count the percentage of made bets on the other machine, only this one is considered. In the same way the final prize is swelling depending on the numbers of bets. In order to make it comfortable for the player, on this machine you will find a special measurer, which will show you the present sum of money which is included to the jackpot. One minus of this Stand Alone Progressive machine is that the payouts tend to be smaller than in the other linked progressive slots. Usually the casino controls such machines because they are united together along the one establishment or they can even be in the different accommodations but of the one property. In such way the amount of bets are higher and the percentage of the jackpot is rising. It's really firm prize that a gambler may win if he's going to play slots machines. 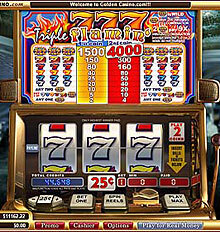 The only difference of this type of a slot progressive machine is that the slots that can stand in different buildings, casinos are not operated by one property. They have different owners. Imagine how huge can be the jackpot! 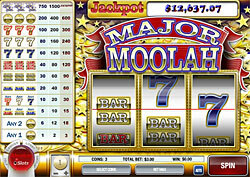 The casinos receive only the percentage of the winning, but the main company owns the slot games. Because of the administrative things such as locating these machines at the different accommodations and this entire operating thing, the percentage of the payback is much lower. So, do you see how slot machines history has been developing? The progress consists in the fact that you are accumulating your future jackpot due to the other gamblers, who in the same way hope that the final prize will be theirs. But still remember, that more rarely the players can hit the jackpots and those modest awards that they provide aren't worth your strength and persistence. But who knows, maybe this is exactly your hand that will receive the crazy sum at the Wide Area progressive slot machine!